Biscuit Pudding is always considered a classic dessert and chocolate Biscuit pudding has been a family favourite as long as I can remember. The layered arrowroot biscuits and chocolate cream and the chocolate sauce everything is finger licking good. Biscuits go with everything; check my Apple Biscuit Crunch, it is also an amazing combination. If you have a sweet tooth check my other wonderful recipes like Double ka meetha , Chocolate brownies, Sponge Fruit Trifle delight, Tender coconut pudding, Golden Pineapple Pudding or Homemade soft Gulab jamuns. As a kid I loved this pudding and since it was easy to make my mom allowed me to help with the layering of biscuits and I would boast to my friends that I prepared the pudding!! It is really a great way to bond with the kids, as they can help you with layering. It does not involve much cooking, except for the chocolate sauce, so the kids can easily prepare this like Black currant muffins. The original version of the recipe included adding egg to the cream, but this modified version is vegetarian friendly with no egg, something I changed for my vegetarian friends. Please don’t hesitate looking at the long line of ingredients, as this is really easy to make. And let me assure you the taste is just fabulous and a great treat for all chocolate lovers! 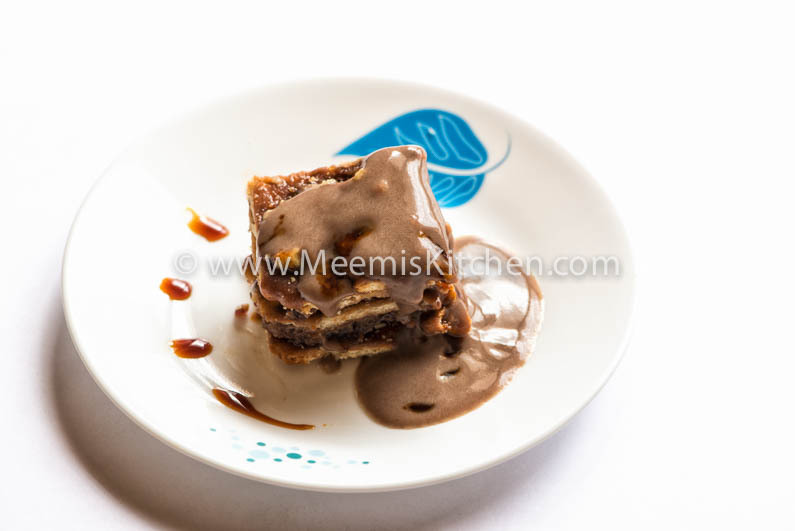 So treat your taste buds with the yummy Chocolate Biscuit Pudding ! 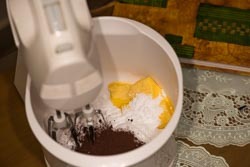 Mix Butter, Sugar and cocoa with an electric egg beater for one minute. Add 2 tbsp of warm milk and mix well for a creamy texture. 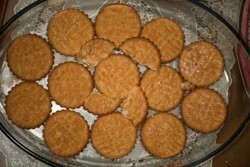 Heat milk and soak the biscuits one by one in the hot milk and start layering in a shallow pudding bowl. Once the biscuits are layered spread a thin layer of chocolate cream. Then top with biscuits and again cream till there are four layers of biscuits and cream (depends on the width of your bowl). Top should be covered with cream. 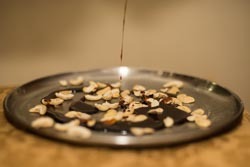 For Praline, grease a flat steel plate and spread the cashew on it. Put 2 tbsp sugar in a sauce pan and heat on small flame. Slowly the sugar will start to melt and brown. Don’t stir till all the sugar is melted and browning. Gently stir and turn off the heat and immediately pour 1 tbsp hot water and stir well to have a brown flowing caramel (careful when pouring the water as the sugar syrup could be very hot). Pour this hot syrup immediately on to the cashew. Allow it to cool and break into small pieces. (My mother used to crush them to get a coarse praline) Crush in a mixie for few seconds to get a finely crushed praline mixture. 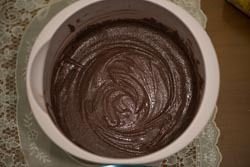 Spread it evenly on top of the layered pudding (if the praline mixture is more, you can refrigerate it in an air-tight container for next use). Cover and put in the fridge. 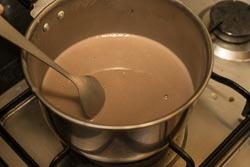 For the sauce, mix in cold milk custard powder and cocoa powder and sugar and heat it stirring continuously to avoid forming lumps. Once you achieve a thick flowing consistency turn off the heat and stir for some time. 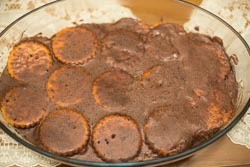 While serving, the layered biscuits should be cut into squares and placed on the pudding serving plate and topped with sauce. You can decorate with chocolate syrup for maximum appeal (optional). Arrowroot biscuits are the best for preparing this but in case that is not available, you can opt for Marie biscuits also. 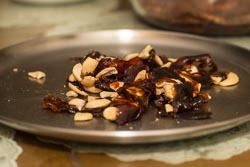 Praline mixture brings slight bitter taste and rich feel to balance the sweetness but you can avoid it and just add crushed cashew. The sauce should be warm and the biscuit pudding should be cold for the perfect taste. Use only Un-Salted cooking butter. This pudding can be prepared even by kids. Adult supervision required while preparing Praline Mix. 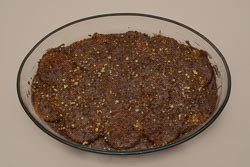 Enjoy the heavenly chocolate Biscuit Pudding and don’t forget to tell me how you liked it. God Bless! !